Last month NASA released these maps that encourage new ways of looking at the Moon. The three circles are oriented with an unusual perspective, with Tycho in the center and Mare Imbrium at top. Tycho is most readily identified in the right map as a red spot; at the bottom of the left topography map is the looming darkness (= lowness) of the South Pole-Aitken Basin. 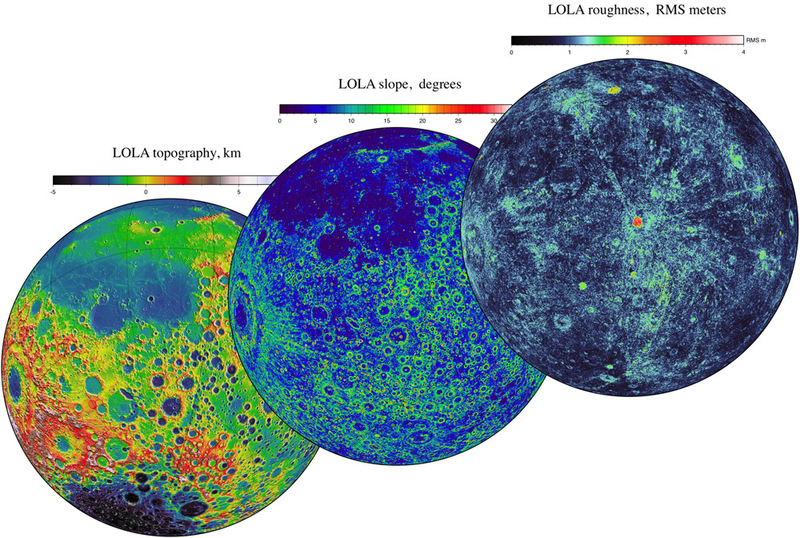 All the maps are based on the LOLA data, the LRO altimeter that has pinged the Moon more than 6 billion times (so far) to continuously build up a high resolution topo map (left). We see that maria on the floors of basins are low areas (blues) and crater rims are higher (red). The middle map depicts slopes calculated from the altimetry. This shows, as expected, that the mare (dark blue) are relatively smooth and have low slopes. Interestingly, higher slopes (about 15° = green) occur inside most craters rims, whether the crater is young or old. Red coloration shows that many craters have slopes of 25° to 30°, and although these steeper slopes seem more prevalent among younger craters, they also occur on the rims of some older ones - see Schiller. The map on the right is most interesting because it shows something that is't so obvious: surface roughness at the meter scale - notice that the range from black to white is only 4 meters. The floor of Tycho is quite rough at LOLA measurement scales, and high res optical views show why: highly textured impact melt. Because meter scale roughness gets eroded away over time by smaller scale impacting, this roughness map could be the basis for classifying the relative ages of all larger young craters. The first result is obvious - on this half of the Moon Tycho is the roughest/youngest large crater. Near the top you can see that Copernicus has small areas of red - about 3 m roughness, but most is yellow (2 m). I could not find any other new maps that show roughness and slope for the other sides of the Moon, nor at higher resolution. Presumably those data sets are available somewhere as full global mosaics that can be mapped onto rotating spheres for high res, vertical views anywhere. Also: Rays are rough at the 1 m level - I wonder if Reiner Gamma is? Yesterday's LPOD: Snow At the Pole?